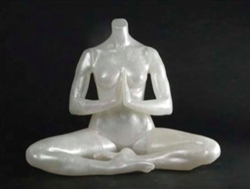 Egghead Gloss White seated female mannequin with left leg crossed on base. Comes with high heel which is removable for shoes. Stool base is included. Arms and legs are removable to easily dress mannequin. Round metal base comes with calf and heel rods for your support choice. To see all of the matte white egghead female poses in this collection - click here.